Whether you need a simple fix or major repairs, we've got you covered. We repair all types of fencing. 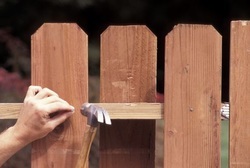 Our fence repairs are guaranteed to last, restoring the full function, security and beauty of your fence. We can handle any level of damage and any fence material to ensure that all your needs are met. We proudly provide fence installation throughout Spring Hill, including Brooksville, Hernando Beach, Ridge Manor, Hudson and the surrounding areas. To request an on-site inspection and get a free quote for fence installation or repair, complete our convenient form or call us at 352-835-5040 today!